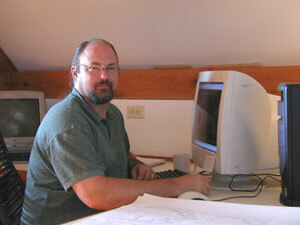 Tim Chauvin is the president of our company and our chief designer. His home designs have won numerous awards and have been featured in many national publications. 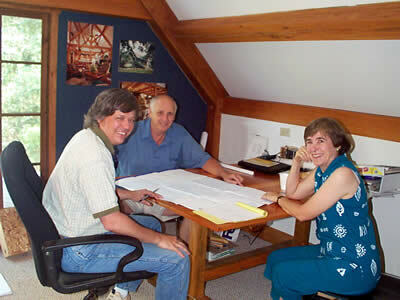 That's Tim working with some clients reviewing plans for a new home in the Texas Hill Country. Robert Hinton is our drafts person and is responsible for fleshing out our timber frame designs and turning them into working construction drawings. You gotta really like these guys! They can begin design work with nothing more than a vague notion of your dream home or they can adapt fully developed architectural drawings of conventional construction into a coherent timber framed home. They approach either choice with the same enthusiasm. Designing your home is something we charge for and it requires a sizable investment in time and money and that's before your bank will loan you the funds to build your home. We do your design work under a design contract for a competitive hourly fee plus direct expenses such as copy fees and postage. I think this is the most equitable working relationship for all involved. You only pay for the time and effort that you use. If you can clearly describe your desires to us, do your homework and make decisions in a timely manner, you help us both. There is no fixed cost of design based on square footage or total cost of construction. We usually have several homes in design at any one time and a waiting list of several more. We work on a first come first served basis and stick with you until the work is finished. Since all clients are treated the same way, we will occasionally get behind because of unanticipated design changes, but if you are patient, I promise you that you will receive the same attention to detail as those in front of you when it's your turn. Designing your home is a demanding but rewarding process. Planning and preparation are the keys to a successful project and this is one area where we standout from the crowd. After the design and construction drawings are finished, ../budget/budget.aspx budgeting comes next. We work by the hour so you only pay for what you use. Our current rate is $75/hr. We require a $1,500 retainer (20 hrs of design work) when we implement a Design Contract. You can expect to spend about $2-$3/sqft designing your home. The end result of our design work is a detailed set of Construction Drawings used to actually build the home. We design most of the homes we build but we also work well with other architects. It's your choice. Before we begin your design project, we will conduct an on-site visit to see your property. It typically takes about 8 to 12 weeks to complete the design process and produce the required construction drawings. Your project may take longer depending on special design elements and how quickly you respond with information we need. We work with most of our clients remotely so it really doesn't matter where you live, we can make the design process happen. 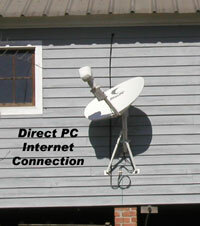 We support color faxing and high-speed Internet satellite access. So we can trade color digital images, move large files and answer e-mail quickly. All clients get their own Web page so they can see the results of our work no matter where they are located. We are directly connected to the Internet and can support large file transfers such as AutoCAD. Working with us remotely couldn't be easier! You can see a list of our current design and construction projects by jumping to the Events page on our Web site.